I have two old Muskoka chairs which I just love. They are comfortable and represent the pinnacle of laid-back cottage relaxing. Plus my sons gave them to me over 10 years ago for my birthday. Sadly I didn't treat them very well up at the Cottage lot. I left them in the shade and didn't protect them from the weather for the winters. Plus I didn't varnish them very well. Fortunately they have come through this mistreatment well. Although the finish is ugly with peeling varnish and stained wood, the underlying structure is sound. 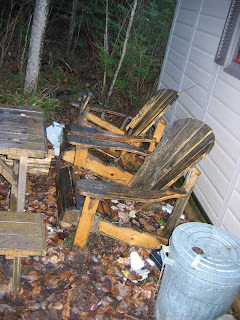 One of my tasks once the Cottage gets built, so that means late next sumer is to refinish the chairs. I can almost feel myself in them already with a cold one in hand. I will definitely share with you how the job comes along. Are there any readers that have tips on refinishing?